We have a confession…..we can go through bags of mini Cadbury eggs like they are going out of style!! They have a creamy chocolate center with the delicious candy coating. We paired them up with a buttery thumbprint cookie and a dollop of chocolate frosting. You are going to love these cookies for your Easter celebration! 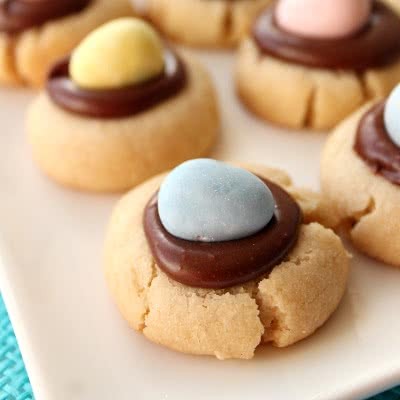 A buttery thumbprint cookie topped with chocolate frosting and a Cadbury mini egg. In a large mixing bowl beat together butter and sugar until creamy. Add in flour, baking powder and salt until blended. Do not over mix. Roll dough into small balls and place on ungreased cookie sheet. Bake for 10 - 11 minutes. Remove from cookie sheet and cool completely. Then add in cocoa, powdered sugar, vanilla and hot water. These are adorable! The little eggs are perfect. Such a great idea for Easter. Did you use unsalted or salted butter? Also, did you use all purpose four? Hi Allison. We used salted butter, but we have used both in the past. We used all purpose flour. Hi Megan. These cookies are so good. I like the cookie bottom, but my girls are big fans of Cadbury eggs. The frosting on these cookies sets up pretty well, but it's not hard. It's a soft frosting that sets up. I hope that explains it. Ha Ha!! Will the frosting be ok if made a day before? How would you store them? It works best and is easy to spread if you make it and then frost the cookies. Store the cookies in an airtight container. If longer than a day, maybe store them in an airtight container in the fridge. I am sorry I worded it wrong. If I make the cookies the day before Easter will that be ok. Also do you think if made a week ahead would they freeze well? :) Sorry about that Nina. They should be fine a day ahead. Put them in an airtight container so they stay soft. They should freeze just fine. Have a great weekend! We just used regular granulated C&H sugar. Hope this helps and your cookies are great for your Easter weekend.